Retail sales on Black Friday climbed 6.6% this year to an estimated $11.4 billion, according to ShopperTrak, which counts foot traffic at malls and stores. Last year, sales climbed just 0.3% to $10.7 billion, which was a record one-day sales amount at the time, according to the company. "This is the largest year-over-year gain in ShopperTrak's National Retail Sales Estimate for Black Friday since the 8.3 percent increase we saw between 2007 and 2006," said ShopperTrak founder Bill Martin. "Still, it's just one day. 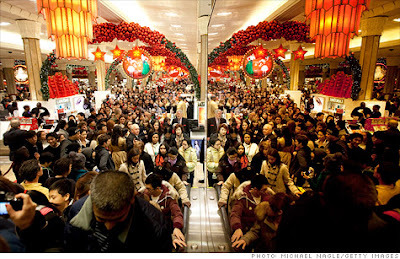 It remains to be seen whether consumers will sustain this behavior through the holiday shopping season." However, sales have been strong throughout the entire month of November with retailers rolling out holiday deals earlier than ever. In the two weeks leading up to the week of Black Friday, retail sales were up 3.6% and 3.8%, respectively, ShopperTrak reported. Online sales have also proven to be strong, with many big-box retailers and department stores offering deals online earlier this year.